By helping children to take good care of their teeth, you are starting habits that will last them all their lives. You can’t expect young children to create their own effective dental care routine. Rather, you need to help them learn these good habits. The sooner you get them started, the sooner it will become a routine. As a general rule, children and adults should at least brush twice a day - in the morning and before bed. As soon as your children have teeth, you should start brushing them. As soon as they have two teeth side by side, you should start flossing them. When they can brush and floss for themselves, you can let them take over the job. From a young age, teach your child about cavities and gum disease. Explain how flossing and brushing can keep plaque under control, which can prevent cavities. Your child should visit the dentist by their first birthday or within 6 months after their first tooth comes in. The goal is to have your child visit the dentist before there is a problem with their teeth and get them used to attending regular appointments. In most cases, a dental exam every six months will let your child's dentist catch small problems early. If your drinking water is not fluoridated, you can also talk to your dentist about fluoride treatments for children. 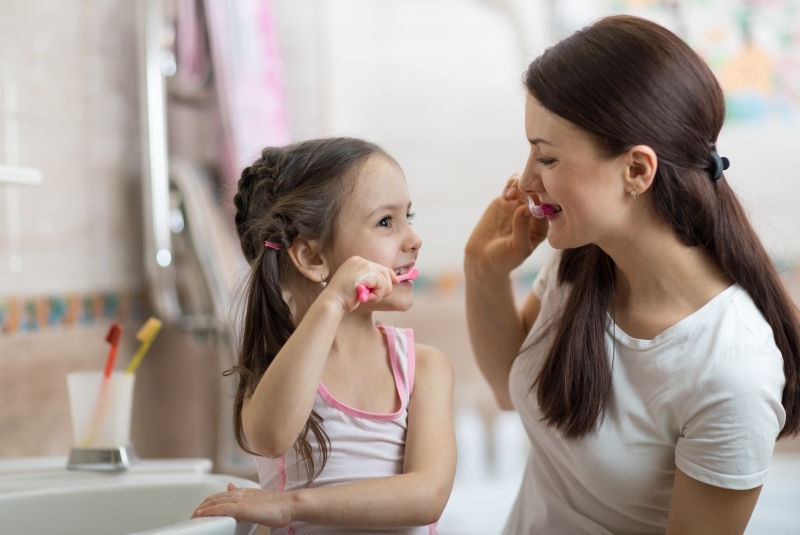 Help your kids have a healthy smile by making dental hygiene fun. Here are a few ideas to help keep your child excited about good oral care. Create a sticker chart for brushing and flossing. When your children brush and floss, they can place a sticker on the chart. Make brushing and flossing a family activity. By brushing together, you can set a good example and also that they are brushing well enough and long enough. Take them shopping with you and let them pick out proper dental care tools. Consider buying brushes, floss, tongue scrapers, and more. If they enjoy a certain television character, find out if the character has a special on oral health. They might enjoy watching the show and take away a lesson at the end of it. Books area also a great way to introduce the concepts of teeth brushing and flossing, as well as getting them comfortable with the idea of visiting the dentist. Visit your local library or bookstore to see what they have on the shelf. Surprise your child after a dental appointment with some fun family time, or a reward for good behaviour, but be sure to steer clear of using sugary treats as rewards. To learn more about oral hygiene for your child, or to set up a dental appointment for them, contact our North Delta children's dentists.